Paul Klee was born on December 18, 1879, in Münchenbuchsee, near Berne, Switzerland. His father Hans, a music teacher, taught Klee violin and encouraged his son’s artistic talents. Forced to decide between music and art, Klee chose to study art, yet he retained a life-long passion for music, which served as an important source of inspiration for his work. In 1898, Klee moved to Munich to study drawing and painting, first with Heinrich Knirr and then with Franz von Stuck at the Munich Akademie. Opus I, Klee’s first series of etchings, was indebted to von Stuck’s Symbolist ideas, though the works were enlivened by a sharp satirical wit. In 1902, Klee returned to Berne to live, making frequent trips back to Munich to visit the pianist Lily Stumpf, to whom he was engaged. In 1906, Klee married Stumpf and settled in Munich. They had a son, Felix, in 1907. Stumpf’s earnings as a piano teacher provided Klee with the financial means to dedicate himself to his art. From 1906 to 1910, he worked in relative isolation, experimenting with various styles and media. He created caricatures and Symbolist drawings, painted on glass and produced small works on paper, mainly in black and white. Although Klee attended exhibitions of Impressionist and Post-Impressionist painting in Munich and studied the works of van Gogh, Cézanne and Matisse for inspiration, most of his work from this period was monochromatic. In 1911, Klee met the artists Alfred Kubin, Wassily Kandinsky and Franz Marc and became involved with the German Expressionist group Der Blaue Reiter (The Blue Rider). Klee shared Der Blaue Reiter’s belief in the spiritual in art and in the importance of authentic creative expressions such as those found in children’s art, the art of the insane and in the art of popular and tribal cultures. His graphic work was included in the second Blaue Reiter exhibition, held in February of 1912, and illustrated in the Blaue Reiter Almanach. The activities of the Blaue Reiter sparked Klee’s interest in other avant-garde art. He saw the work of the Cubists and the Italian Futurists in German galleries and in April 1912 traveled to Paris to meet Robert Delaunay. Delaunay’s Orphist style and his writings on color and light had a profound effect on Klee. In 1914, Klee traveled to Tunisia with the painters Auguste Macke and Louis Moillet. The two-week trip proved to be a turning point in his career. The North African light awakened his sense of color and liberated his forms. Gradually detaching color from physical description, Klee moved decisively toward toward abstraction. As he remarked in his diary: ‘Color posseses me. I don’t have to pursue it. …Color and I are one. I am a painter.” Klee’s shimmering watercolors of Tunisia remained important sources of inspiration for the rest of his career. In March 1917, Klee was called into military service. Assigned to work as an accounting clerk at a flying school in Gersthofen, he was able to continue drawing and painting until being demobilized in December of 1918. Upon his discharge, Klee returned to Munich and began painting in oil for the first time. He created a series of meditative, intensely colored landscapes influenced by Cubism and the abstract translucent color planes of Robert Delaunay. A large 1919 exhibition of Klee’s work in Munich established his reputation and brought him to the attention of Walter Gropius, who invited him to join the faculty of the Bauhaus in 1920. Klee’s years at the Bauhaus were among the most important and fruitful of his career. He produced a vast range of paintings, drawings and prints, taught the preliminary course, lectured, supervised craft workshops and devised volumes of theoretical notes based on his teaching. Nearly half of Klee's 10,000 works were produced during his ten years at the Bauhaus. At the Weimar Bauhaus, Klee’s constant experimentation and interest in color theory gave rise to a host of new techniques. In oil, he developed the abstract compositions now known as ‘magic squares,’ in which blocks of color are built up on a black ground. He created a series of oil transfer drawings, which involved tracing a pencil drawing, placed over a page coated with black ink or oil, onto a third sheet. 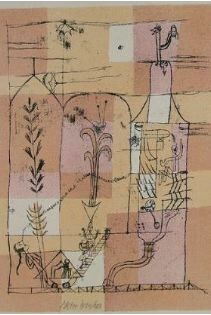 The oil transfer drawings were generally of a whimsical or absurd nature; their motifs often reflect the theatrical and dance activities central to Bauhaus life. Klee painted dreamlike pictures filled with fanciful forms and, in 1929, striated compositions inspired by a trip to Egypt. In April 1931, Klee ended his contract with the Bauhaus and began teaching at the Düsseldorf Art Academy. During this period, he developed a pointillist painting technique consisting of layers of color applied in patterns of small spots. The works were related to music. By overlaying different fields of color and allowing them to intermingle, Klee aimed to create polyphonic picture structures analogous to polyphonic (i.e. many-voiced) music. Klee’s time in Düsseldorf was increasingly overshadowed by the rise of the Nazi regime. When the National Socialists declared his art "degenerate" in 1933, Klee returned to his native Berne. The “Entartete Kunst” exhibition of July 1937 included 17 of his works, and the Nazi party removed 102 pieces from German state museums. In 1935, Klee developed the first symptoms of scleroderma, an incurable skin disease that plagued him until his death in 1940. Physical hardship and the increasing gravity of the political situation in Europe were reflected in his later work. Klee’s forms became broad and generalized, almost hieroglyphic, his scale larger and his colors simpler.